Whenever I go grocery shopping, I always find myself eyeballing the gum in the checkout aisle. Chewing gum is one of those little things in my life that’s worked for me over the years. I like buying really minty gum, and I’ll often chew a piece for a little while before I meet someone. While on some level I know it doesn’t do an enormous amount to improve my breath, the idea that it does help a little increases my self-confidence. Thus, sometimes I talk myself into buying a pack of gum at the checkout. Other people buy other things on impulse at the grocery store. Tabloids. Magazines. That tasty new kind of salsa that they see on the end caps. A walk through a grocery store is often an exercise in impulse control. That’s why it makes a lot of financial sense to go to the store less often. Shopping at the grocery store once a week simply reduces the number of trips you take to the store (saving you time and fuel) and the total amount of time you spend in the store (saving you money on impulse buys and, again, saving you time). 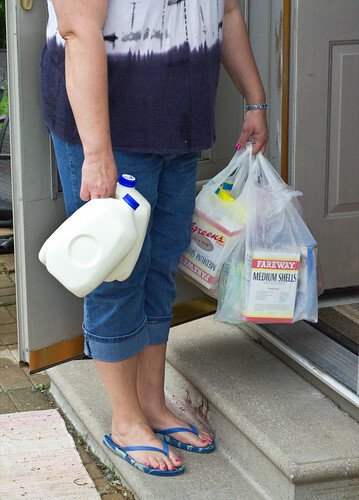 The challenge for many people, though, is making sure that they have adequate items to get through the week. After all, the reason people stop at grocery stores is because they need an item or two to help them get through the next few days at home. The solution to that problem is a little bit of planning. Make a meal plan Sketch out what you intend to eat for each meal during the week. I usually use a grid with four columns and a row for each weekday, with the four columns being breakfast, lunch, dinner, and snacks. Write down everything that you’ll eat on this meal plan, including beverages. You don’t have to be perfect, just pretty close. From that meal plan, create a grocery list. What I usually do is write down all of the ingredients to cover everything on the meal plan, then take that list to my cupboards, pantry, and refrigerator to see what we have. I’ll start crossing off items until I have a list of the things I don’t have on hand. Then it’s off to the grocery store. I stick to the list as closely as possible, as I know that everything I need is on that list. This helps with impulse buys, too. At the end of the week, I’ve spent a lot less on impulse buys and spent a lot less time going to the grocery store. That’s a victory. Repeat it every week and you’re headed down a great financial path.